Buy a book today and I’ll creatively deface it for free! 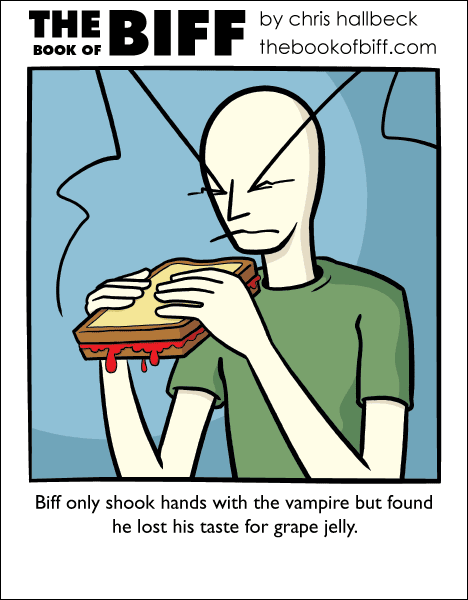 I think there are a lot of adults that continue to eat peanut butter and jelly sandwiches. I stopped somewhere in my teenage years. I would try it out again every few years but I think I just had a natural aversion to bread. Sandwiches have a surprising amount of bread in them. Is grape jelly suppose to be red? Or, is that blood? Yeah I know what you mean, what’s up with that thing with the bread? Now I can’t stand the kind of sandwiches I used to make as a kid. 5 points to Strong Like Seamus! Toaster waffles are much better for making sandwiches than slices of bread. Once you learn that, you can enjoy sandwiches again.